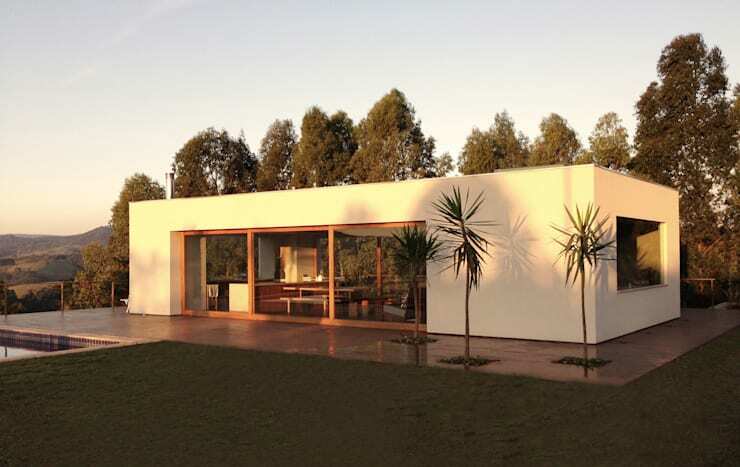 Today on homify 360, we bring you a dream home in Brazil—the house that was built for hosting the best parties! As you'll see if you join us on a tour of the property, the homeowners definitely had entertainment as one of the biggest priorities when commissioning this home. The Casa Cab, as it is called for being located in the city of Cabreúva, was built to be a weekend home for a young couple. This is why we will see simple features and a minimalist design, as the focus had always been on recreation, and not so much daily living. This does not mean, however, that the architects did not make use of very high-quality materials and a captivating design to bring the house to life. We are sure you will agree that this house is covetable in any circumstance. Just take a few minutes to explore the home with use, you will not be sorry! Here we are! Welcome to the Casa Cab, the perfect home for parties, since 2010. This weekend home is nestled between the striking beauty of the natural landscape in São Paulo, and as we can see from this first image already, the landscape had much to do with the choice of location. Who wouldn't want a weekend home surrounded by the soothing natural landscape with tall trees and green grass? The building itself is also well worth exploring in more detail, and is just as extraordinary as the lovely surroundings. Because of the unevenness of the terrain, the house had to be divided into two levels. On the top floor, we find the main entertainment area, including the age pool, barbeque, pizza oven and change rooms. On the lower level, we will find the home theatre and bedroom suite, which is half-buried in the ground and allows for milder temperatures than what is experienced above ground. What do you think of this scene? Not bad at all, wouldn't you agree? Well, this spectacular sight is found on the top deck once again, including the extraordinary swimming pool of the home. This massive pool seems to stretch on into infinity. 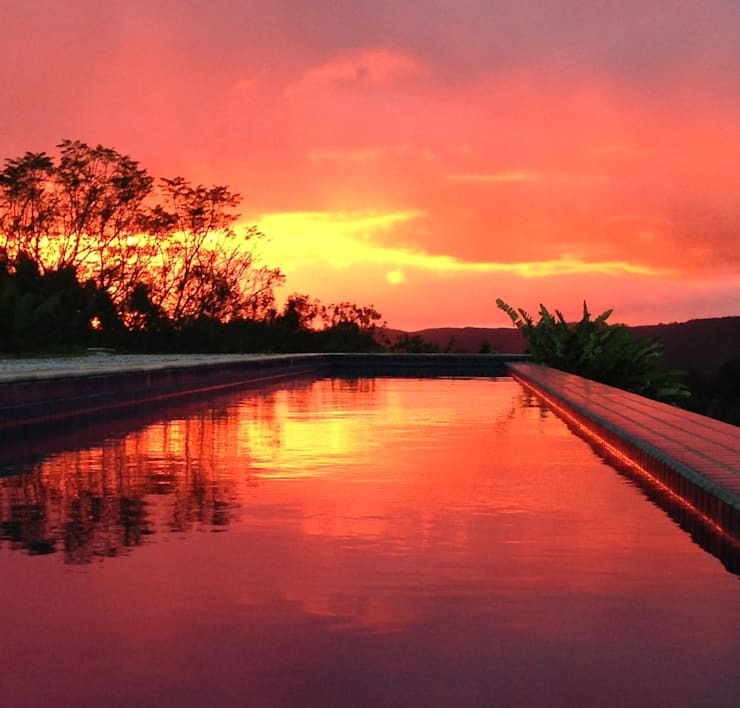 At the perfect angle to catch each evening's sunset against the backdrop of leafy vegetation, we are sure that there will be many nights such as this for the homeowners to enjoy with their friends and family. Next up in spectacular holiday homes, take a look at the white island dream home! Now, just a quick glimpse inside the building itself. What we have here is a segment of the changing rooms found on the top deck of the building. This room is conveniently placed on the top floor in order to provide easy access to it from the swimming pool. We just wanted to take a moment to appreciate the materials in this composition. 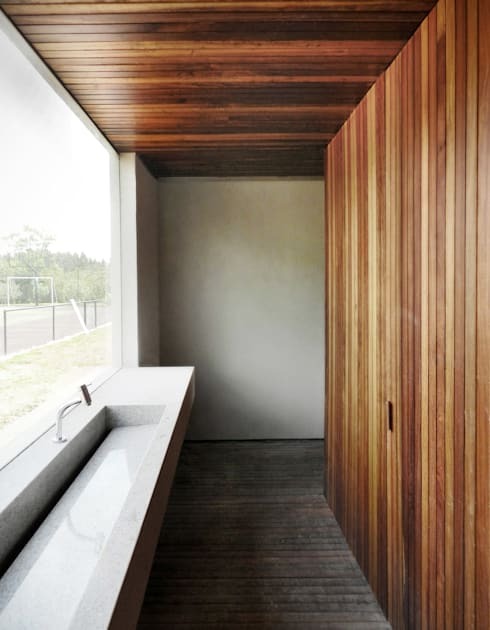 The walls and ceiling are covered in a warm and rich timbre, whilst the floor is also decked in wood, but which is duller to create a sense of contrast in the room. To the left, there is a striking, elongated basin installed in front of a large window with panoramic scenes of the outdoors. Let's cut right to the chase and go to this entertainment area which we have been speaking about from the start. 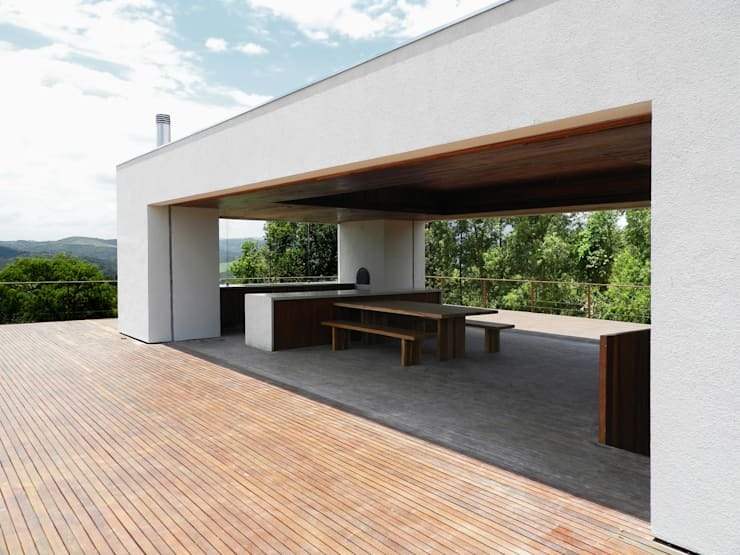 On the top floor of the home, we find an elegant wooden deck which is not only resistant to weather conditions, but also provides a warm, natural look. This appearance is modernised by the short width of the timber planks used in the deck. This also creates an interesting visual rhythm throughout the space. Underneath the structural canopy with a recessed ceiling and lighting, we find the cooking and dining area, the place where the parties will actually take place. Furthest form us in the image, we can see a kitchen space, including ample counter top space for culinary endeavours. Right in front of the kitchen, we can see a large wooden bench with accompanying seats were the feast can be immediately enjoyed after preparation, and all of your guests can dine and converse in comfort. On the lower level of the house, we come to the half-buried section which includes the more private areas of the home. Here we stop to take a closer look at construction details. 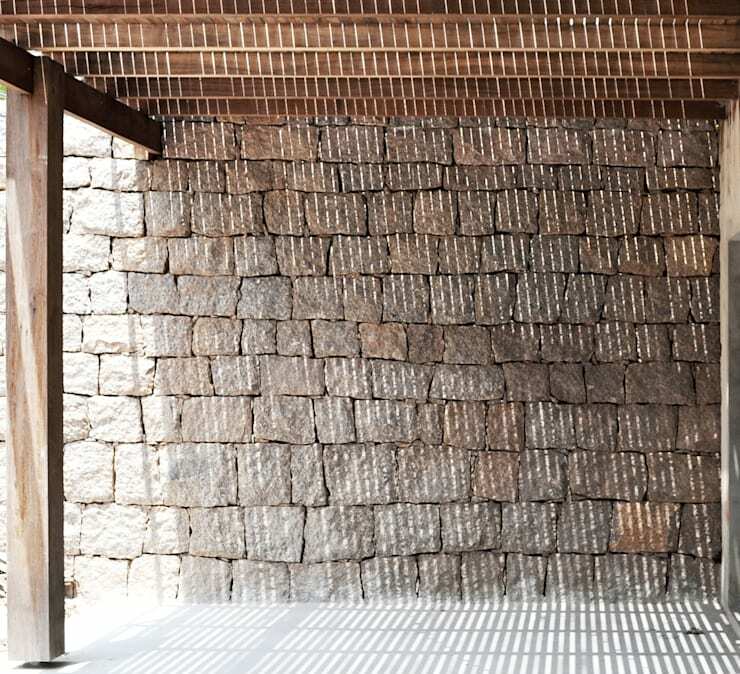 At the back of this image, we can see the stone outer wall of the building, adjacent to wooden pergola and screen which allows streams of sunlight to fill the place. The stone used in the wall is definitely most significant in this composition. The rough stone bricks used here create a rustic and warm appearance, reminiscent of Mediterranean villas and the relaxed emotions they evoke. What did you think of this weekend home?